Monday morning I woke up and I was so tired, but knew that I needed to start the week off right with a run. Over the weekend we had spent about 6 – 8 hours in the 30 degree sun, and I had little bits of sunburn all over my arms and calf muscles. The sun had really taken it out of me. Before I allowed my brain to dwell on it too much, I got up and put my running gear on. It helped a bit that I was excited to use my newly swapped running shoes, as I was keen to see how my feet would pull up afterwards. Even walking down the stairs seemed hard work, but I put on my shoes, bid Mario goodbye and got out there. The first kilometre went quickly, the second too. The third my brain started to tell my body that it was tired, and I should walk instead. But I kept going. I had managed to get into a bit of a rhythm with my breathing and my pace, and while I could feel myself beginning to slow down a bit, I still kept pushing and kept running. 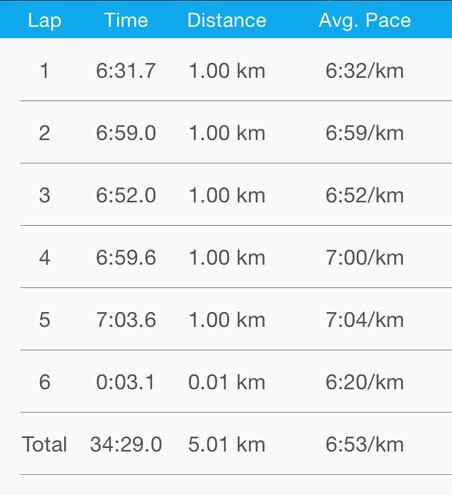 Looking at my stats later, even though my time was a bit slower than my previous run, my improvement factor was higher. I put this down to it being much more of an effort – I was outside for a start, and I certainly hadn't been feeling energetic to begin with! I got home and I was exhausted. I helped myself to a nice cold drink of water supplemented with some Ensura Rehydration Energy Fuel. Normally I just leave that stuff for when I'm doing some serious exercise – a 2 hour bike ride, triathlon etc. But I was so tired, and so sweaty from the heat I thought it would be good to get some magnesium and carbs straight into my body. I sat down on the lawn out the front of the house, drank my cold drink and threw the tennis ball for my dog to play fetch. The Endura certainly did the trick, and I was back to feeling normal quickly. The most exciting thing was that my feet felt great. I didn't have ridiculous blisters on the tips of my toes, and I didn't feel like my feet had spent the entire run being crunched up. The new shoes were feeling fantastic – just the way new shoes should! This morning, Tuesday, I walked my dog instead and took her for a swim down the beach. Tonight I will get in a run on the treadmill at the gym, and a weights session afterwards. I can't wait until I finish reading the Hanson's Marathon Method so that I can start structuring my runs into something more meaningful, although I still do enjoy just getting out there running and clearing my mind!